The impact of the 1966 Chicago Freedom Movement on the decade’s civil rights struggles was as significant as any other campaign of that era. 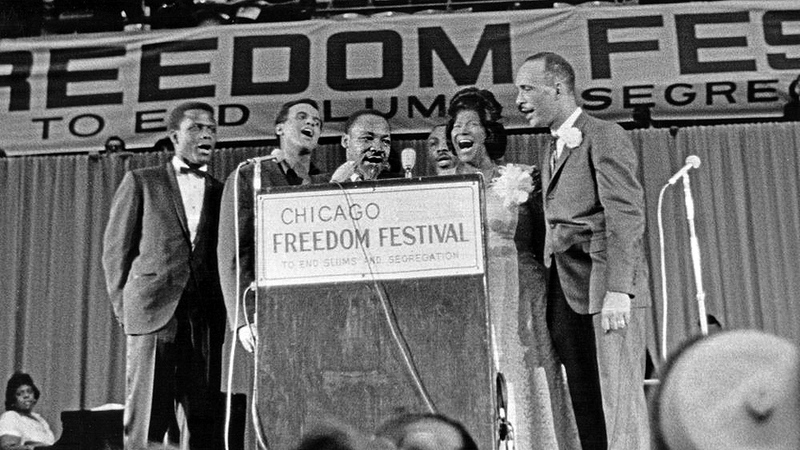 By bringing the freedom struggle to Chicago, where the Democratic Party machine was closely linked to the national party and the White House of President Lyndon Johnson, the movement raised the bar and gave the struggle for equality a national focus. It was a time when thousands were on the move. Calling for an end to Jim Crow in public accommodations, they boycotted the city bus system in Montgomery, Alabama. They sat in at lunch counters across the South, demanding service. National guardsmen and federal troops were protecting children who were breaking down the walls of segregated schools. Black and white teams of youth had gone south to challenge poll taxes and organize voter registration drives. “Whites Only” signs were being torn down. People from all walks of life were getting involved in the struggle to eliminate the legacies of slavery. Although the struggle took on many forms and covered diverse areas of the South, it came to be called simply the “movement.” To say someone or some organization was “part of the movement” was to say it all. Made up of many diverse groups, the Southern Christian Leadership Conference (SCLC), founded by Rev. Dr. Martin Luther King, Jr. and Rev. Ralph Abernathy in the mid-1950s, sparked the imagination of civil rights supporters everywhere. As its prestige grew far beyond its numbers, the SCLC and its leaders became the spark plug that ignited mass protests across the South, bringing the demands of the movement to the attention of the nation as scenes of snarling police dogs flashed on screens television. King and Abernathy decided to bring the movement “up south” and the search for a place to begin brought them to Chicago. There they found the ingredients they were seeking: a substantial base of support among both white and Black ministers, a base of Black and white activists, steeled in struggles against racist hiring practices, police brutality and racial discrimination in housing and education. As important as any other consideration, the struggle for equality enjoyed the support of important sections of organized labor: Region 4 of the United Auto Workers (UAW) and the Packinghouse Union, both led by African Americans. In addition, many individual leaders and rank-and-file activists had long been associated with the civil rights movement. SCLC planners noted that Walter Reuther, the UAW president, walked arm in arm with King at the 1963 March on Washington. King and other SCLC leaders saw these as the essential elements of a successful campaign. Thus was born the Chicago Freedom Movement (CFM), with King and Al Raby, a leader of Chicago’s Coordinating Committee of Community Organizations (CCCO), its co-chairs. CFM activities and policies were determined by an committee made up of representatives of the city’s diverse civil rights organizations. News photo showing Dr. Martin Luther King Jr., and his wife Coretta, waving from the Chicago apartment building where they lived during the 1966 campaign. On the far right is author Carolyn Black. SCLC dispatched field staff to help lay the groundwork. In the spring of 1966, King, his wife Coretta Scott King and their children moved into an apartment on the west side of Chicago and the campaign of the summer of 1966, with its demand to end slums, began in earnest. Chicago’s mayor Richard J. Daley made known his displeasure that “outside troublemakers” were coming to the city and told all who would listen there were no slums in Chicago. He also declared that he would not meet with King, thus drawing a line in the sand. For those who were to lead the summer campaign, these statements were ominous. The nation and the world were to soon learn what they already knew — that the likes of Bull Connor, Lester Maddox and George Wallace had their counterparts in the Richard J. Daleys of Chicago and other northern cities. During the summer of 1966 the movement staged a number of marches in white communities protesting housing discrimination, the practice generally accomplished by red-lining and block-busting. Although the marchers were pledged to non-violence, the community was not. Each march saw an escalation of violence, until the chief of police asked city hall to seek an injunction because his resources were being stretched. The ferocity and scope of the violence that met the marchers was unmatched by any previous attacks anywhere. King was felled when struck in the head with a stone during a barrage of assorted missiles. Marchers feared for their lives when their parked automobiles were rolled over and their tires flattened, set on fire and some pushed into a small lake in the park. Many feared that without their cars there was no way to escape the crowd when the demonstration ended and, with nightfall coming, they could be in mortal danger. By summer’s end Daley had to back down. After several face-to-face meetings with Freedom March leaders, he agreed to negotiate an agreement and appointed a 19-member committee chaired by Thomas Ayers, head of Commonwealth Edison, the giant utility company. King and Raby headed the movement’s six-member team. On the committee, the real estate board had two members, the religious and liberal community four. Others included one each from the City of Chicago, the Chicago Federation of Labor and the Commercial Club of Chicago. Eventually a 10-point agreement was signed that called for various measures to strengthen the enforcement of existing laws and regulations with respect to housing. The city would enforce its 1963 open housing ordinances and Daley agreed to work for state open housing legislation. The real estate board agreed to end its “philosophical” opposition to open housing, while the city housing authority agreed to seek “scattered sites” for public housing. Cook County promised to provide “the best housing available” for those receiving public assistance and a similar pledge was made by city agencies for those dislocated by urban renewal projects. Savings and loan associations and mortgage institutions agreed to make money available on an equal opportunity basis. Others pledged efforts to educate their members and the public on the importance of the measures outlined in the agreement. Others thought the campaign a failure because the agreement contained so little, especially in the area of enforcement. 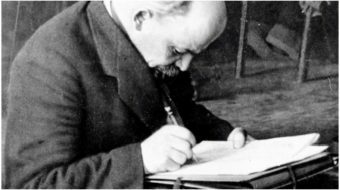 Not only did the Chicago Freedom Movement forever change the way the people of Chicago lived, it highlighted the tremendous problems that would confront the movement as it sought to bring the struggle to the big cities of the North. The strategy and tactics of the southern Black Freedom struggle, where segregation and discrimination were open and labeled with signs, had to be reworked when applied to the de facto injustices of the big northern cities. The agreement won by the summer campaign of the Chicago Freedom Movement in 1966 was a work in progress, one that confirmed, once again, that freedom is a constant struggle. Bill Hogan, then Father William Hogan, remembers the Summer of 1966. Well he should, having served as recording secretary of the Coordinating Council of Community Organizations (CCCO), the group that, together with Martin Luther King, Jr. Southern Christian Leadership Conference (SCLC), formed the Chicago Freedom Movement (CFM), which led the massive civil disobedience direct action campaign of the summer of 1966 in Chicago. Hogan said that while King was “first among equals,” the composition of the CFM staff was exceptional and reflected the scope of the movement: James Bevel, C.T. Vivian, Al Sampson, James Orange, Jesse Jackson and Andrew Young, who went on to become mayor of Atlanta and later U.S. ambassador to the United Nations. “All were veterans of major battles in the South,” he said, adding that key players from Chicago included Edwin “Bill” Berry of the Urban League, Bob Lucas of CORE and Carl Fuqua of the NAACP. There was always the question of welding the conflicting views and goals of individuals and their organizations. 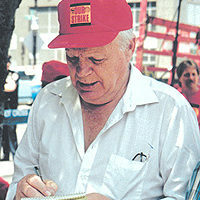 Through it all, Hogan was there busily taking notes. Can you imagine strong-willed people with as many ideas of what should be done. Try reflecting all of that in the minutes! “Although that song, as were others, was generally seen as a morale builder meant to strengthen resolve, we in the CFM saw it in a different context,” Hogan said. Over the course of countless demonstrations and picket lines, the “prize” was established: open housing and school desegregation. “The two were really two sides of the same coin,” Hogan said. “Segregated housing patterns guaranteed segregated schools, with all that implies for quality education.” As a consequence of that decision, he said, they made real estate companies their main focus, together with insisting on the right to use the city’s parks. Video: An excerpt from the documentary “King in Chicago.” Interviews with activists, including Carolyn Black, who worked with Dr. Martin Luther King Jr. during the 1966 Chicago Freedom Movement. Bill Appelhans was a member of the Du Bois Clubs in Chicago. The Du Bois Clubs were a broad-based pro-socialist youth organization named in honor of Dr. W.E.B. Du Bois, African-American sociologist, writer, activist and Communist.